Work.Life is a rapidly expanding network of beautifully designed hot desking and shared office spaces in London. 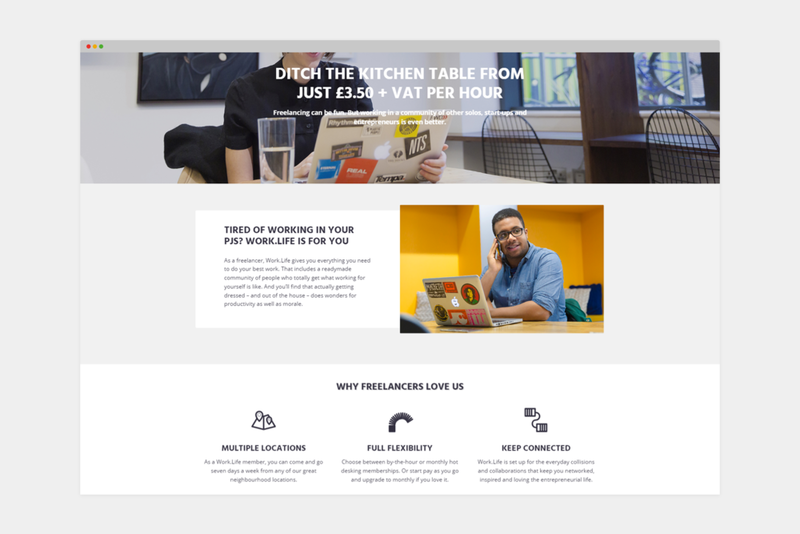 Its mission: to allow freelancers, start-ups and small businesses to better integrate work into everyday life. In a crowded and largely generic marketplace, Work.Life’s points of difference are its personal scale, its sense of genuine community and its locations in the city’s coolest residential neighbourhoods. The Copy Kitchen developed a language and style to express the brand personality – relaxed, welcoming and inclusive – and clearly communicate membership options and benefits. Outputs included a printed welcome pack, a new website and landing pages to support PPC campaigns, plus tone of voice guidelines and style guide. A great workplace is one that lets you live a good life even when you’re at work. At Work.Life, we don’t talk about work/life balance because we don’t believe they’re separate things. Fun, fitness and wellbeing are woven into the fabric of our locations. We chose our neighbourhoods because they’re places people love to live. And for you, that means being able to fit a lot more life into your work. We’ve designed our workspaces around what matters to members. We’re small enough that everyone gets to know each other. Like one big team, but without the office politics. We’re located close to where our members live, keeping commute time to a minimum. Members can work across any of our locations. Fun and work go together here like pizza and cheese. We offer a busy social and events calendar and lots of fitness and wellbeing perks. Options start at just £3.50 + VAT an hour. We keep our prices low and easy to understand, with no surprises. You’re not alone at Work.Life – you’re part of a welcoming community and support network of fellow members. We’re fine with that. Choose ultimate pay-by-the-hour flexibility, or month-to-month membership for hot desking, coworking or private office space.